Here’s the scenario: you scoured the Internet for a reliable WordPress support service that can help you with your WP tasks. Finally, you found one but only to realize that they got acquired by another company and that the company does not allow you or anybody to use the service anymore. That’s what happened with WordPress support service WP Curve. In 2016, they were acquired by GoDaddy, but GoDaddy stopped accepting new customers for WP Curve, which means, anyone interested in using WP Curve for WordPress maintenance services is out of luck. 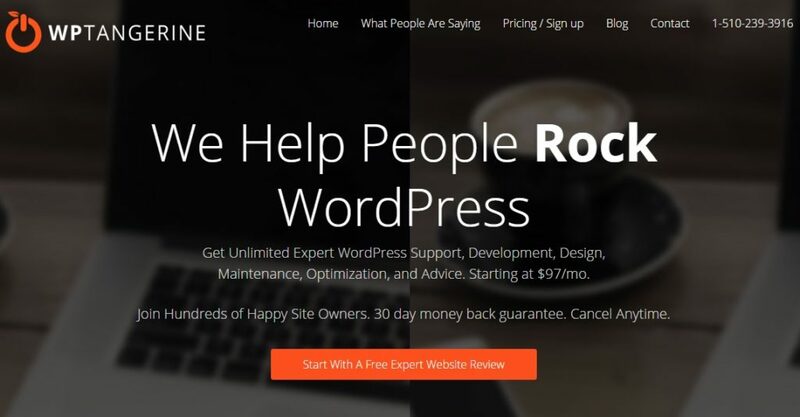 If you just got started with WordPress or had used WP Curve’s service in the past and now are looking for an alternative service that’s just as reliable, then you’re in fortune. We carried out a thorough research on WP Tangerine‘s services and offerings, and found that they are indeed a great replacement replacement for WP Curve. a small team of dedicated professionals with one very specific focus: Helping people rock WordPress. So if you’re looking for a reliable service that can help you rock WordPress, then you should definitely check out WP Tangerine. WP Tangerine has been built from the ground up to be exactly the solution that business owners and professionals need. Below are our top findings on why WP Tangerine is a great alternative to WP Curve. You need WordPress support services whenever you need them, which is not necessarily during a typical 9 – 5 business day. WP Tangerine lets you submit tasks 24/7, with a one business day turnaround and priority emergency care. This means you can reach out to them at anytime even for emergency site care and they’ll respond quickly. If you have a bunch of small WordPress tasks on your to-do list but lack the knowledge or time, then WP Tangerine will come in handy. WP Tangerine manages these WordPress jobs for you. According to their website, you can “submit unlimited tasks and projects as you want, tasks will be worked on for up to 1 hour per business day (2 for their Pro Plus plan.” And instead of paying per job, you can submit an unlimited amount of tasks for one monthly fee. This unlimited WordPress support plan not only allow you to offload some of the administrative burdens but also bypass constraints that can sabotage your business growth. Just like WP Curve used to do, WP Tangerine offers some of the best WordPress maintenance services around at an affordable fixed monthly fee. You can choose from three different tiered plans starting at just $147/month. Additionally, they offer a FREE EXPERT WEBSITE REVIEW, something you can take advantage of to have an idea of how they work. WP Tangerine’s plans are flexible, which means you may upgrade or downgrade as needed. Also, you can cancel your plan at any time since no contract is required. It seems WP Tangerine are so confident that their plans and service will meet users’ needs and expectations that they offer a 30-day money back guarantee. WPTangerine seems to follow a simple process to bring users on board and complete tasks. Their website shows that all you have to do is: Sign up >> Submit tasks >> Kick back and and focus on the bigger picture and enjoy more free time. No reason to complicate things. No need to learn any new software or figure out any complex business process. WPTangerine’s website says they’ll send you daily updates and provide attentive client service. Notable big names like TechCrunch, CNN, and Sony Music use WordPress and these big players have dedicated teams taking care of their WP websites. Just because you’re a small business doesn’t mean you can’t have a WordPress support team like the big guys. And just because GoDaddy acquired WP Curve doesn’t mean you can’t get similar or even better support for your WordPress site. WP Tangerine is a great WP Curve alternative and offers many (if not more) of the same services, benefits, and advantages.